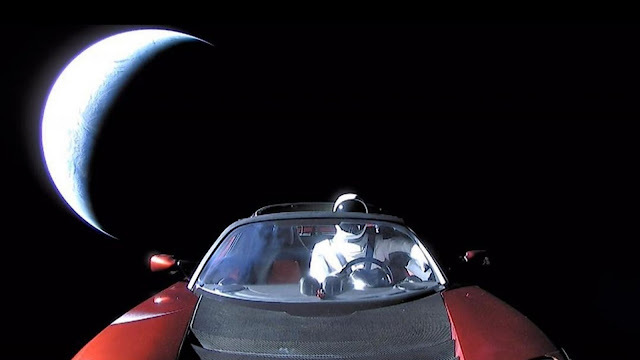 After reading "Elon Musk's Tesla Roadster and Starman Leave Earth Forever in This Final Photo" article by Space.com (View Article Here), I wanted to share this other article I came across about previous marketing moves Elon Musk has made in the past that are also brilliant. I should also add I'm sort of obsessed with Elon Musk. Some of the most successful marketing tactics that Tesla used to build its following seemed completely insane at first. Here's how to apply them to your own brand. Not many brands are as fascinating as Tesla. When Elon Musk built his brand, it wasn't the first automotive manufacturer. It wasn't even the first to bring an electric vehicle to market. So how did he grab our attention? The fact is, Tesla is a fascinating concept to begin with. But on top of building personal vehicles that drove like race cars, Musk used some marketing tactics that may have seemed counterintuitive. Rather than focusing on what to TELL his customers and prospects, he focused on how the world saw his brand for what he DID. And the world was fascinated by the Tesla brand. Any company, in any industry, can fascinate by applying these innovative marketing tactics. Imagine driving up to a charging station. Every other car there is a Tesla. And every other driver is a Tesla owner. No Mercedes, no Lexus, no Porsche. Now that's an exclusive form of service. It's almost like a fan base club house. Tesla owners talk to other Tesla owners. It's a love fest. When people feel that they're part of the select few, they're more committed. And they make people on the outside want to get inside to see what all the fuss is about, building a sort of exclusivity. Are there exclusive offers that you can extend to your own customer base? Think about hosting a luxurious customer event so that you can organically build a network of raving fans. 2. Encouraging consumers to "hold the puppy"
If you have kids, you might be familiar with this phrase: "I don't want to buy the puppy. I just want to hold the puppy." Of course, once you've held the puppy, you've already bonded with it. Musk built a sales process all around holding the puppy (or in this case, the car). Tesla car brand showrooms are "galleries" where consumers are allowed to look, but not buy. All orders are taken online. This might seem like a pain (and it kind of is) but here's the genius: It means that the salesperson drives the car to your home. Once you've seen that car parked in your own driveway, it's really easy to project a future that includes your driveway and that car. And just like that, you've held the puppy. Are there products that you can deliver in person to your customers' homes? Can you offer a service on a trial basis to ensure that your customers experience complete satisfaction? Tesla retains ultra-confidentiality by requiring all visitors to sign a contractual NDA. All visitors. Even if they are just visiting the company's corporate offices, and not its research and design facilities. The chosen few who do get through that confidentiality gauntlet feel like celebrities. They got access to something so rare and insider that few ever will. It says "There's something incredibly rare happening here, and we think you're one of the few who deserve to see it." What if you made every client sign an NDA before receiving your product or services? I tried this once, in a little experiment. Before prospects could see the plan for my new entrepreneurial course, they had to sign an NDA that they would not disclose any information about the course material. As a result, people perceived the course as proprietary, scarce, and intensely valuable. That grew sales more than I could have imagined. Most CEOs seek high-profile forms of media to build awareness of their brand, endlessly grinding in the message with TV budgets. Musk, on the other hand, reinvents his PR in the same way that he reinvented the electric car. To share some of his most PR-worthy messages, he choses an unassuming platform: via a single tweet on Twitter. In October, following the devastation of hurricanes Irma and Maria, Musk tweeted that he could rebuild Puerto Rico's devastated electrical grid by applying Tesla's existing solar energy or battery storage technology. Puerto Rico's governor Rick Rossello responded without missing a beat. With your own business, find an opportunity to do a significant charitable deed or give away an awesome gift. The public's response may be all the PR you need. Suddenly, your brand is newsworthy. Elon Musk says that Tesla is a battery company first, and a automobile manufacturer second. In so doing, not only has he opened up the scope of his brand for other markets, but he has identified the element that is often viewed as the weakest link in other electric vehicles. By placing his focus on his competitors point of weakness, he creates the illusion of superior quality. Are there components of your business that will allow you to expand in unexpected ways? A kitchen appliance manufacturer, for instance, can comment on the latest trends in kitchen design. A realtor can hold seminars on neighborhood safety or outdoor fitness. A financial planner can give clear direction and organize panel discussions on compliance with new tax laws. Take a cue from Elon Musk, and the success of your brand will accelerate.